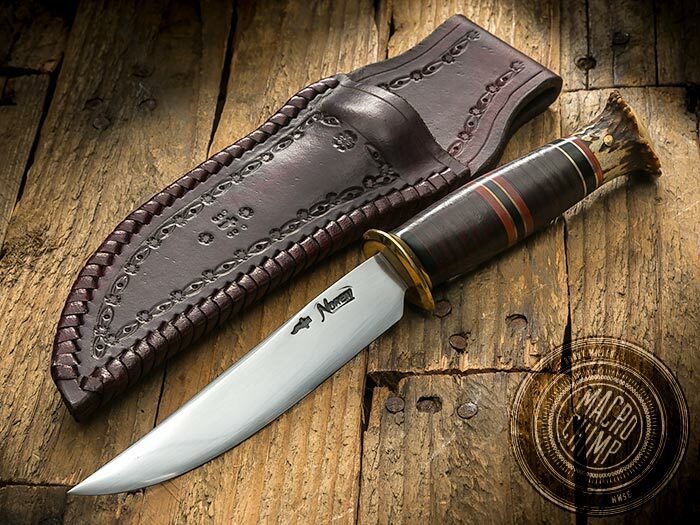 Mastersmith Doug Noren's Scagle Hunter features a forged blade of 1084 High Carbon Steel, a stacked leather handle with nickle silver, copper,and red, black and white micarta, sculpted bronze guard and crown stag pommel Includes a tooled 9 oz. hand laced leather sheath by the maker. Doug grew up around machines and foundry equipment, forges and metal because his family owned a pattern and foundry business. He has always been interested in history and has been involved in every aspect of it. From making fine furniture, hand carvings, harness making, building cast iron wood stoves, post and beam construction buildings to restoring antique cars- he has done it all. He had a pioneer blacksmith shop and started making knives, with his scouts, when he was a scoutmaster in the 1970’s and 1980’s. He used old files and every scout ended up with a knife. One of the reasons he really enjoys making knives is because it combines all kinds of mediums. As well as steel, he uses, wood, ivory, bronze, leather, copper, nickel silver, sterling silver, and even stone in his knives. However, the people he has met in the knife world has been the driving force. He loves the camaraderie and feeling of meeting “Family” each time he goes to a show or ABS Hammer in. “Everyone seems so friendly and we really try to help each other”. Doug grew up in the same little town in Michigan that William Scagel lived in and remembers him and has always been interested in his knives. Besides being influenced by Scagel and making his replicas, he loves the challenge of making large English bowies like those made in Sheffield, England by Joseph Rogers.